Air Handling LP | Hawk Research Laboratories, LLC. 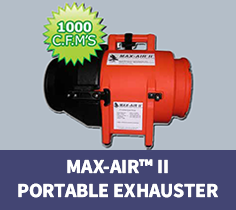 The Max- Air II exhauster provides the best protection against fumes for the customer and the refinisher. In addition, the high volume of continued air movement improves application performance through quicker flash times, reducing runs, sags and blushing in the finish. The solvent resistant 8-inch hoses can be easily connected together for any desired length. Max-Air II comes with a full manufacturer’s warranty. 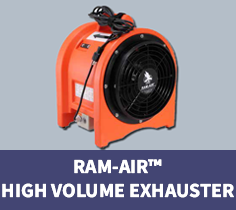 The Ram-Air high volume exhauster is a 12-inch turbo fan. The fan's blade shape is designed to move the large amounts of air efficiently. The complete system includes a motor, housing and intake adapter, 25-foot intake hose with strap, 25-foot exhaust hose with strap, 12-inch connector with strap and 100 disposable pre-filters.